Written by Joel on February 4, 2014 Blog. It’s hard to believe that, in just over two years, WooCommerce has come so far. After all, WooThemes is a WordPress company who has always specialized in, you guessed it, themes. To be in a position where we are writing a blog post, with such massive numbers, is a privilege. Along with this growth comes the privilege and responsibility to continue to do everything we can to make WooCommerce the best eCommerce platform in the world. Before I go into the numbers behind WooCommerce, I want to briefly touch on the concept of open source. Open source is in large part what makes WooCommerce so great. Open source enables developers, designers and everyday people to tweak WooCommerce and build functionality on top of WooCommerce. With WooCommerce’s growth WooThemes has been able to empower merchants to sell but also we’ve also created space for thousands to benefit through theme development, extension development and client work. As WooCommerce becomes an increasingly popular eCommerce platform, doors are opening up everywhere for us to work more closely with large integration partners, as I have briefly blogged about previously. It’s a nice feeling to know we are on the radars of many large players in our industry. Early on in these discussions, many of these companies were asking me the same questions; How many merchants are using WooCommerce? What size are these merchants? If you were to break them down into industry verticals, what would that look like? Can you give me some examples of merchants (alluding to well known merchants)? Believe it or not, WooCommerce does not track any data from your WooCommerce storefront. This puts us in a tough spot when it comes to actually understanding our users. What’s a Woo to do? BuiltWith is a web scraping service who’s aim is solely to track the growth and progress of variety of different services. I remember the first time I spotted the BuiltWith data, my eyes lit up like a kid in a candy store. At that time, BuiltWith was showing that we had 50,000 stores. BW has enabled us to pull lists of WooCommerce and WooThemes sites. Once we pulled these country lists, we found a capable Woo-ling to vet thousands of websites, in the hopes of learning more about the use of WooCommerce. To identify well known business or organisations using WooCommerce. To verify websites using WooCommerce (that it is not just installed in the background or being used as a cataloguing tool). To gather country specific info in our top markets. To get an understanding of what percentage of WooCommerce sites are powered by WooThemes. To create resources for our support team and marketing team to be able to relay site examples (country specific, market vertical specific & theme specific). Our capable Woo-ling, Nicole, was brave enough to take on the task of vetting websites, day-by-day. Many wouldn’t have lasted but Nicole enjoyed the process of uncovering the many uses of WooCommerce. Yes, there was the occasional adult website, a number of 502 errors and a unruly amount of spreadsheets. In the end, we have some very useful metrics, website examples and categorized site lists, all of which are starting points in understanding our customers, supporting our customers and being able to convey some of this uncanny growth to our integration partners. What does 2 Million + Downloads mean? We’ve regularly shared the popularity of our plugin and marveled at as the growth has compounded. It took us well over a year (Jan 2013) to hit 500,000 downloads, less then six months (June 2013) to hit 1 million and then less than six months (Dec 2013) to hit 2 million. A month later and we are sitting at over 2.2 million. In July last year we wrote a piece entitled Ecommerce & WooCommerce: Stats, Trends & Tips where we were first given insights into the actual usage rates of WooCommerce and now we are excited to present the latest figures to you. 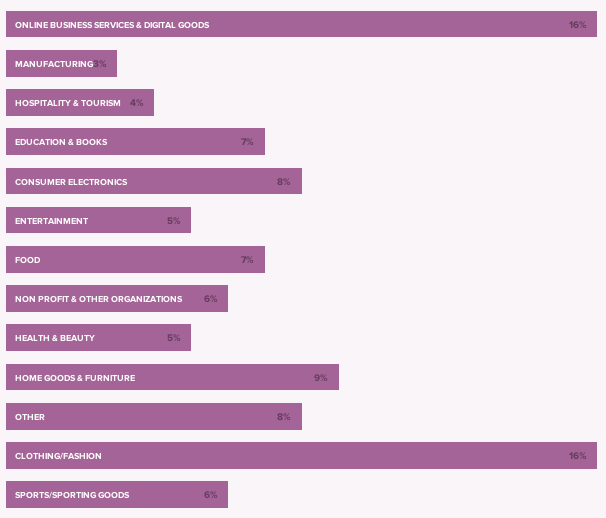 Additionally we’ve done our own analysis of some of the BuiltWith data to get a breakdown of the types of businesses using WooCommerce, to identify demographics of sites, and to verify how these sites are using WooCommerce. 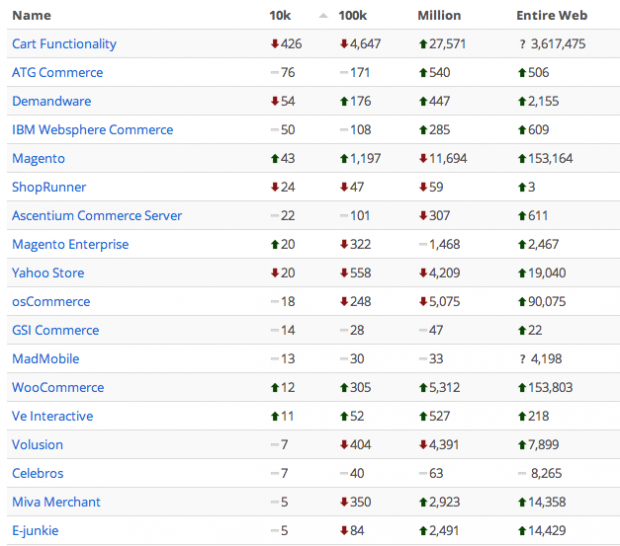 The above chart covers ecommerce growth per platform & growth within the top 10K, 100K and million sites, ranked by site visits. 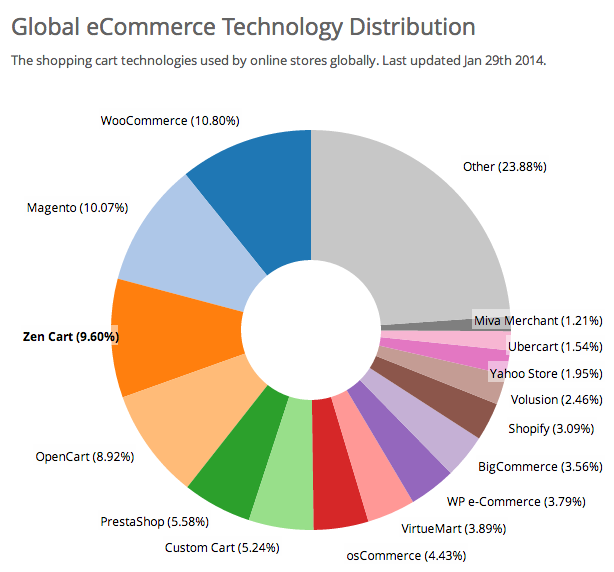 WooCommerce now powers more than 10% of ecommerce sites. The chart to the left focuses on stats based on country specific reports and analyzing of a sample set of .com/.org/.net domains. The chart to the right is based on the vetting of a sample set of 2000 sites. As you can see not all sites listed on Builtwith.com are actually selling with WooCommerce. In fact we found that 15% of sites either have WooCommerce installed but it was not visible or it was nowhere to be found. Types of Businesses Using WooCommerce. Based on a 5000 site sample set. Part of the joy of exploring sites using WooCommerce has been identifying some large, well known companies using WooCommerce to power their online store or catalogue. Name dropping aside, we have found thousands of innovative smaller businesses who we are equally excited to be identified and we look forward to sharing some of their stories. WooCommerce is helping power innovation by making it easier and more affordable than ever to sell online. Here are a few blog posts which have highlighted some of these innovative sites: American Innovation using WooCommerce and Facebook Site Submission Contest. In a short but useful study we found that 18% (54 out of 300, small sample) of WooCommerce sites are powered by WooThemes, below is a breakdown of the themes used. To see these themes and more have a look at our themes here. What does all this data mean for our customers? The growth of WooCommerce is exciting! Learning about the ways in which our product is being used, helps to inform us as we move forward. Hopefully, the sheer numbers excite you, our WooThemes and WooCommerce users. No one expected this kind of growth! The fact that WooCommerce is empowering so many merchants to sell online means we are doing something right. Getting a better grip on our data means we can leverage this growth to properly represent our user base and attempt to bring you offers we feel you’ll find beneficial. As more service providers approach us for integrations, we are always looking for the most useful and appropriate projects to take on. Additionally, we are working hard to position ourselves to ensure that we get you the highest quality integrations by working with integration partners, whilst providing you with amazing support. WooCommerce vertical specific website examples, and country specific website examples, are also made possible through this project which can prove useful Hopefully this blog post has proven insightful in digging into the growth of WooCommerce. How has WooCommerce helped you? What integrations would you like to see more of? Comments, questions, we’d love to hear from you. I’ve used WooCommerce with a couple of websites and it’s performance is brilliant!!! This is great information. Will designers and developers show clients why WooCommerce is a great option for their ecommerce store. Nice Post Joel, exciting times ahead. Great to see some big names being dropped. Some great numbers there, and everyone loves a bit of name dropping. Thanks for publishing Joel! Great numbers Joel, and it is only just starting! Is this the new Woo or just an oversight? Closing off perhaps controversial posts by not allowing comments? I hope the latter! Your relative growth doesn’t surprise me based on my experience. I tested 3 e-commerce platforms before I arrive at Woo. One of those, WP-eCommerce, didn’t even get past the starting gate as having taken their Gold support package, they never provided support as guaranteed – not one iota within their promised time. I got an admission of guilt but no refund. Go figure! So to me, Woo Commerce excels in its flexibility and support. The documentation could be improved but then again it is a lot better than most. And at least the 30 day refund on extensions is some remedy. Nice Post Joel, exciting times ahead. I didn’t know how big is Woocommerce now. 10% is huge! Congratulations! Well done Woo. I’m surprised JigoShop didn’t make the pie! Very useful post, it should come in handy tonight at the wooCommerce meet up in San Francisco.